This page features 250+ classic jazz guitar licks, riffs, and patterns from the biggest names in jazz. Learning and assimilating the concepts behind these jazz guitar licks is a great way to improve your improvisational skills and expand your jazz vocabulary. Players such as Charlie Parker and Dizzy Gillespie brought fresh levels of excitement to their solos, ushering in a new era of jazz improvisation. In this lesson, you will learn 25 classic bebop licks. You will probably know how to get a blues sound in your rock and blues solos. Bringing out the bluesy side of jazz can be a bit tougher though. Here, you will learn 5 different ways to get to the bluesy side of jazz. Here are 50 easy jazz guitar licks that you can study and add to your vocabulary. The licks are organized by chord type (major, minor, and dominant) and each lick is explained from a theoretic point of view. The II V I progression is the most popular chord progression in jazz. Knowing your way around this progression from an improvisational point of view is essential for every jazz musician. Barney Kessel was a great bebop guitar player and one of the busiest session guitarists of the 1960s (you can hear him on hundreds of famous pop albums). Barney’s playing is full of classic licks, sophisticated vocabulary, and a strong sense of musicality. Charlie Christian was the first electric guitarist and became one of the key figures of the bebop and modern jazz. He influenced numerous jazz guitar players and other jazz musicians (such as Charlie Parker, Thelonious Monk and Dizzy Gillespie) as well. Django Reinhardt was born in Belgium and played professionally since he was 12 years old. Loosing 2 fingers of his left hand didn’t stop him from becoming the world’s most famous gypsy jazz guitar player. George Benson is one of the most successful jazz guitarists of all time. Starting as a pure jazz guitarist and heavily influenced by Wes Montgomery, he later branched off into the pop world where he achieved worldwide success. Known as a bluesy player, and later on a father of modern funk, Grant Green was also a talented bebop soloist who had a strong handle on bebop vocabulary and substitutions. He was one of the finest soloists to ever play jazz guitar. Joe Pass was the master of solo jazz guitar. He started playing professionally when he was 14 years old, but unfortunately got on the wrong track and became an heroin addict. After his recovery he became one of the greatest jazz guitarists to ever play the instrument. Duke Ellington once called Kenny Burrell his favorite guitar player, so, what more is there to say? His style has blues, Latin and bebop influences, a blend that makes him a master of smooth jazz guitar. Pat Martino learned how to play superb jazz guitar twice. He forgot how to play guitar after brain surgery, but that didn’t stop him from being an innovative jazz guitarist with an impressive technique. Known for his enormous contribution to jazz and electric guitar, Pat Metheny has become a household name over his long career. Pat Metheny manages to combine virtuosity with accessibility, resulting in music that is pleasing for two kinds of audiences, hence his popularity. Wes Montgomery is without any doubt the most influential jazz guitarist ever, and it is easy to hear why. His lines have driving rhythm, interesting note choices and always a sense of melody and melodic development that has made him stand out from his peers for the past 60 or so years. Charlie Parker, aka Bird, was a saxophone player, composer, and one of the greatest and most influential jazz musicians of all time. He is one of the founders of the bebop and his playing style and recordings are a treasury of inspiration for jazz musicians. John Coltrane was a saxophone player and one of the most important figures in jazz music. A lot can be learned from his musical legacy, also by guitarists. Miles Davis was a trumpet player on top of almost every important innovation in jazz. Studying Miles Davis’ note choices can take your creativity as a guitarist to the next level. Take Five is a classic jazz standard that many guitarists learn at one time or another in their development. In this lesson, you will learn 5 Paul Desmond licks, arranged for jazz guitar. Though not a guitarist, Thelonious Monk is one of the most commonly studied jazz musicians. In this lesson, you will learn 5 classic Thelonious Monk licks for jazz guitar that you can add to your playing today, with a sample solo included. The lick is a bebop phrase that is usually played over a minor 2-5-1 and is probably one of the most recognizable musical phrases ever. In this lesson, I have written out 5 of the most frequently used patterns found within classic jazz guitar licks and famous solos. Learning each of these jazz patterns will ensure that you have the right tools for creating jazz guitar licks. Check out this top 10 of the best jazz guitar solos (Joe Pass, Wes Montgomery, Pat Metheny, Charlie Christian, etc) as voted by our readers and learn to play a lick out of each solo. Patterns are small melodic or rhythmic units that are very useful for improvising and easy to memorize. 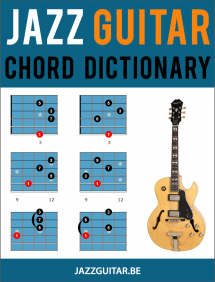 When moving beyond scales and arpeggios, the next logical step is to build your vocabulary by learning these common jazz guitar patterns. II V I chord progressions are the bread and butter of jazz, that’s why every jazz musician should be able to navigate these changes well. In this lesson you’ll learn 5 classic ii V I jazz guitar licks, in both major and minor keys. In this lesson, you will learn seven essential Brazilian jazz licks, as well as study these lines in action over the tune Solar. By studying this material, you increase your knowledge of Brazilian jazz soloing, as well as increase your jazz soloing vocabulary. In this lesson, you will learn how to improve your jazz phrasing by using approach tones that make your improvised melodic lines more interesting and colorful.